IT was the highest rated new British TV drama of 2011. And is due to return to our screens next month (March). I spent several days last month interviewing the cast of Scott & Bailey series two. Nine interviews in total for the new series ITV Press Pack. Including Suranne Jones (D.C. Rachel Bailey), Lesley Sharp (D.C. Janet Scott), Amelia Bullmore (D.C.I. Gill Murray) and Nicholas Gleaves (D.S. Andy Roper). Plus new arrival Sean Maguire as P.C. Sean McCartney, Lisa Riley, who guest stars as Nadia Hicks in the first two episodes, and Downton Abbey star Kevin Doyle, making his return as serial killer Geoff Hastings in episode five. As well as writer Sally Wainwright and co-creator Diane Taylor. My early taster for the new series ran in the M.E.N. yesterday. TV detectives stumbled on a real life police drama while filming scenes in Manchester. Former Coronation Street star Suranne Jones was among cast members on location for hit ITV1 series Scott & Bailey, set in and around the city, when life began to imitate art. Chadderton-raised Suranne, who plays D.C. Rachel Bailey, was filming a scene with Bury-based former Emmerdale star Lisa Riley, who guest stars as suspect Nadia Hicks. “We were in a place where a real raid was happening on the same street that we were filming,” she explained. “So we are in the places where these stories are actually taking place. “That’s how real it is – and frightening for us as well. “You could see real police vans around but the crew just ushered us to get on with filming as we had our own job to do,” added Suranne. 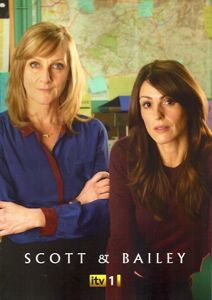 Made by Manchester’s Red Production Company, Scott & Bailey was the highest rated new British television drama of 2011 with 9.4 million viewers. It earned Suranne a Best Performance accolade at the Royal Television Society North West Awards and a nomination at last month’s National TV Awards. The second eight-part series, due on screen next month, includes a violent scene between Lisa and Suranne’s characters. “She punches me in the face and then tries to throttle me. We filmed that for about a day and a half,” explained Suranne, who last acted with Lisa when they were teenagers at Oldham Theatre Workshop. Writer Sally Wainwright again worked with co-creator Diane Taylor, a now retired former Detective Inspector with Greater Manchester Police’s Major Incident Team who helps ensure the scripts are authentic and accurate. Lesley Sharp, who plays Manchester Metropolitan Police detective Janet Scott, said the setting for the drama was an important factor in its success. “The locations for Scott & Bailet are very evocative. It’s not the sanitised version of Manchester. It’s north Manchester, Oldham, Whitefield and Chadderton. “They don’t run around in glass buildings these cops. They’re out and about in back alleys, in windswept avenues – it really adds to the show,” added the Manchester-born actress. The drama was originally devised by Suranne and former Weatherfield co-star Sally Lindsay, who plays her screen sister Alison. Posted in News and tagged Amelia Bullmore, Diane Taylor, ITV, Kevin Doyle, Lesley Sharp, Lisa Riley, Nicholas Gleaves, Sally Wainwright, Scott & Bailey, Sean Maguire, Suranne Jones. Bookmark the permalink. Live in Vancouver Canada so really miss british actors filming great t.v series such as Scoot & Bailey, my two favourite actors. Lesley Sharp & Suranne Jones….Can’t wait !!! !